Modern Shows is so impressed with the supreme talent of Midcentury Modern regular, ceramicist Louise Wilkinson, that we want everyone to see her latest collaboration with the Victoria & Albert Museum in London. If you too love enchanting, story-telling illustrations or have a passion for ceramics do take a trip to see what she has created for Christmas around the V&A’s museum shop. You can even take away a souvenir of this unique collaboration in the form of a card or Christmas bauble. Wilkinson’s installation of perspex screens, her largest scale work to date, has transformed the museum shop into a Winter Wonderland. 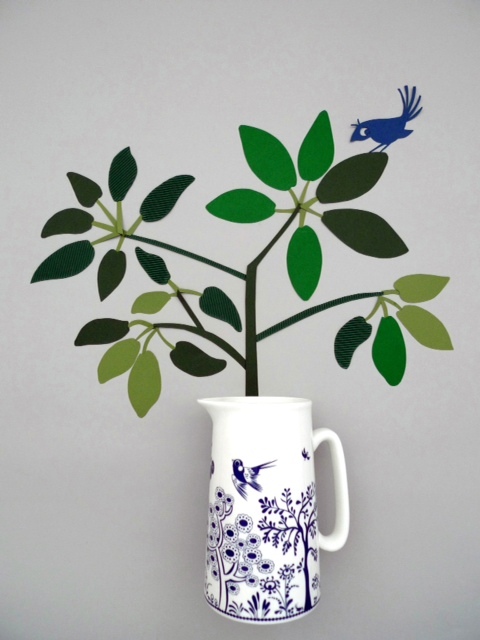 Influenced by the narratives of the Asia-inspired Blue Willow pattern, made popular in Eighteenth Century Britain, the series also has a Scandinavian folkloric feel. Structured to coincide with the V&A’s major Autumn exhibition ‘Masterpieces of Chinese Paintings’, each of Wilkinson’s nine new artworks has a modern take on the Blue Willow story, with witty details and romantic narratives. Following a degree in illustration, Louise hand-designed prints, patterns and characters for children’s clothes in a career that led her to London, where she worked in the fashion industry as a print and textiles designer for 10 years while also moonlighting as a freelance book and magazine illustrator. 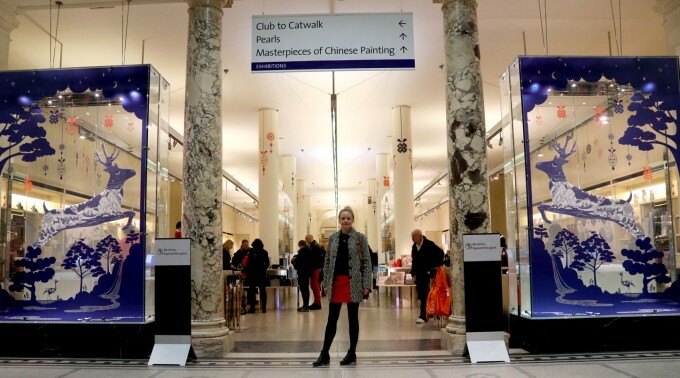 Louise always had a clear vision of wanting to create her own artwork and in October 2012 her wish came true when she launched her first collection at Liberty’s of London after being discovered at the Best of British Open Call. The ‘Maple’ collection features beautifully illustrated fine bone china plates, cups and saucers, jugs, teapots and trays which delight and surprise you with their whimsical mix of history and modern. Central to the pieces is a ‘Tree design’, which is playfully accompanied by berries, owls, rabbits and birds reflecting Wilkinson’s love of the countryside of her youth. If Liberty’s was not enough for her in November 2012 Louise brought the Maple collection to Midcentury Modern, her first selling show, and it went down a storm. 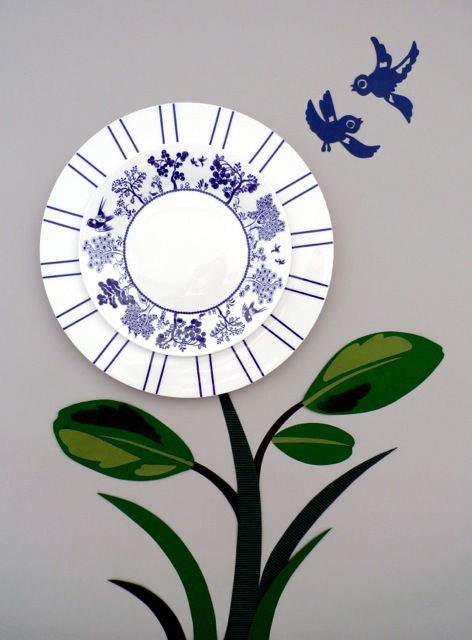 First came a commission to design and create an exclusive decoration to mark the museum’s own celebration of the Willow Pattern which Louise had hand decorated in Stoke on Trent alongside her Maple series. Then came the Christmas card. You can buy both from the V&A shop.But it did not stop there. 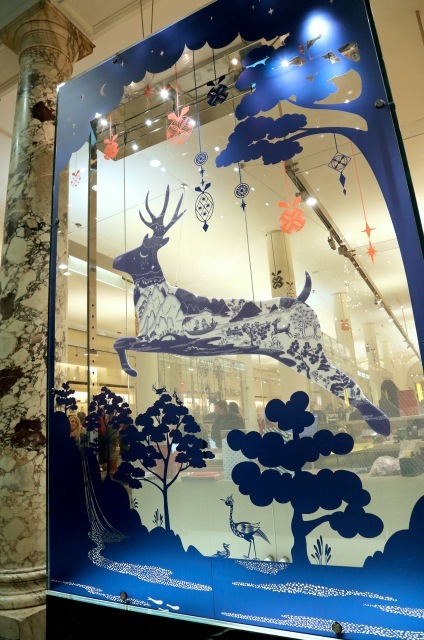 Between them Charlene and Louise then came up with the centrepiece of the exhibition, a stunning deer illustration suspended in the grand shop windows at the entrance to the V&A. 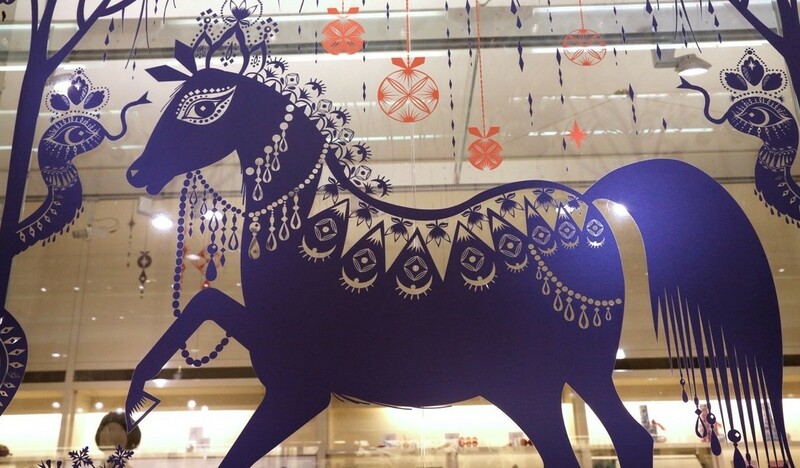 “Louise’s designs contain elements from The Romantic Fable, a story based on the Willow Pattern.” These displays will be “edited” on the 12th day of Christmas to freshen them up for January according to Betteridge. 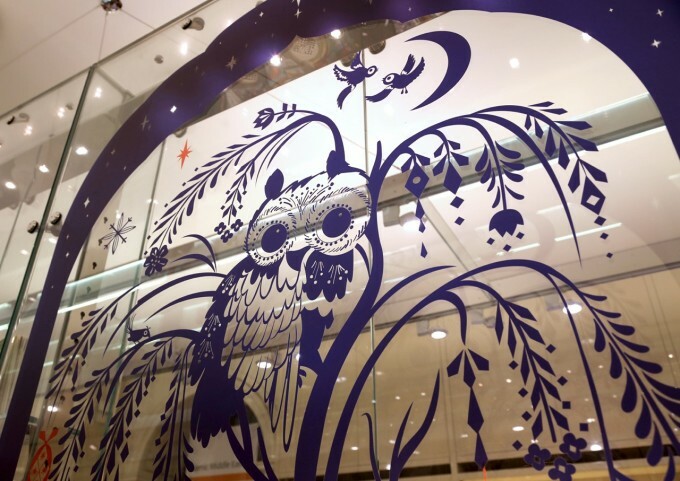 ‘It was a dream to design the entire shop Christmas Installation decor and the large shop windows, all artworks are my largest to date in scale. I love the V&A and it has always been only of my favourite and most inspiring museums,’ says Wilkinson. Stepping into the V&A shop it is impossible to miss Louise’s elegant and timeless illustrations, a fabulous achievement to mark the beginning of her amazing new career, but, before you ask, I could not leave without a piece of the collection. 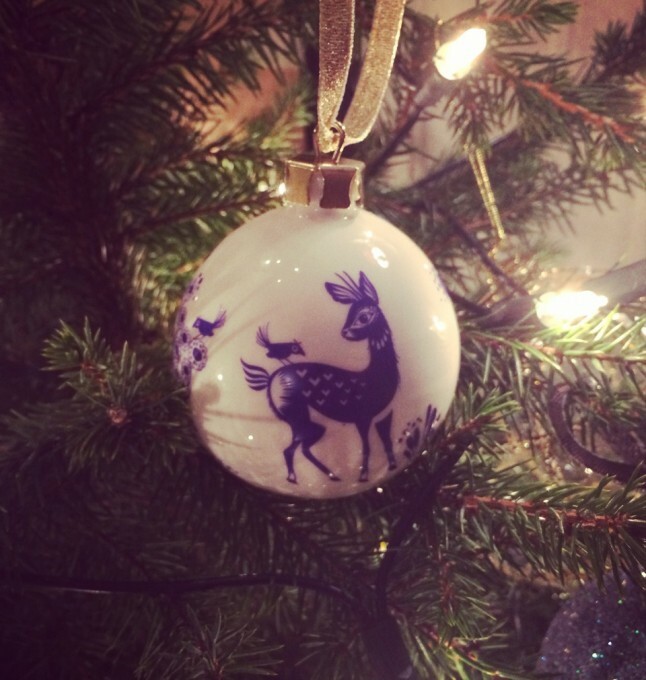 I am proud to say a blue and white ceramic bauble is now hanging happily from my Christmas tree. @LW_studio @modernshows @V_and_A_Shop @Violet_Loves @surfaceview Happy to be a part of it all!